Artwork by Rickey Beckett celebrating 30 years of Ride the Lightning. The late Cliff Burton, bassist of METALLICA, was a widely known enthusiast of Lovecraft’s Cthulhu Mythos tales. The influence of the writer on the artist and the band itself is most evident in the following works. Ride the Lightning‘s closing instrumental piece, Call of Ktulu (working title When Hell Freezes Over), was inspired by both the eponymous tale and The Shadow over Innsmouth. One of the songs from Master of Puppets, The Thing That Should Not Be, features entirely Lovecraft-inspired lyrics. Every single verse references one of his tales, and the text in general is structured much like the words uttered by men who have descended into insanity after acknowledging the existence of cosmic horrors. Hunter of the Shadows (7) is rising! In madness You dwell (8). Cult has summoned a twisted sound! Hunter of the Shadows is rising! ‘Messenger of Fear’ could be a reference to Nyarlathotep. Reference to The Shadow over Innsmouth. The story features the hybrid children of the Deep Ones — the spawn of Dagon — and humans. Insanity is one of the recurring themes in Lovecraft’s tales. Many of his characters are insane, or are driven insane throughout narration. Reference to either Dagon, the fish deity inhabiting the sea, or Cthulhu, trapped in the sunken city of R’Lyeh. In Lovecraft’s fiction, the Great Old Ones are ancient and unimaginably powerful cosmic deities. Cthulhu, Dagon, and other entities are Great Old Ones. Many Lovecraft tales describe ancient and (seemingly) abandoned cities. As examples, R’Lyeh in The Call of Cthulhu, the city of the Elder Things in At the Mountains of Madness and the Nameless City from the eponymous tale. Probably a loose reference to Lovecraft’s The Haunter in the Dark. Probably a reference to Cthulhu. People are sometimes driven insane by his sight. Could also be a wide reference to Lovecraft’s deities and semi-deities. ‘The Crawling Chaos’ is one of the epythets given to Nyarlathotep — and also the title of a short story (unrelated to said character). Some entities in Lovecraft’s fiction (Cthulhu, Rhan-Tegoth, the Elder Things) were woken from an unimaginably long slumber. Perhaps as a homage to their former team member, METALLICA produced another song with indirect Lovecraftian influences: All Nightmare Long. James Hetfield stated in an interview that “It was an attempt to get back to the H. P. Lovecraft mythos with Thing that Should Not Be, Call of Ktulu. This was about the Hounds of Tindalos, which was another crazy mindfuck about these wolves that hunt through their nightmares and the only way you can get away from them is stay within angles (120 or less). You can’t even escape through sleep.” Said creatures were only inspired by Lovecraft, as they were featured in the eponymous short story written by Frank Belknap Long. 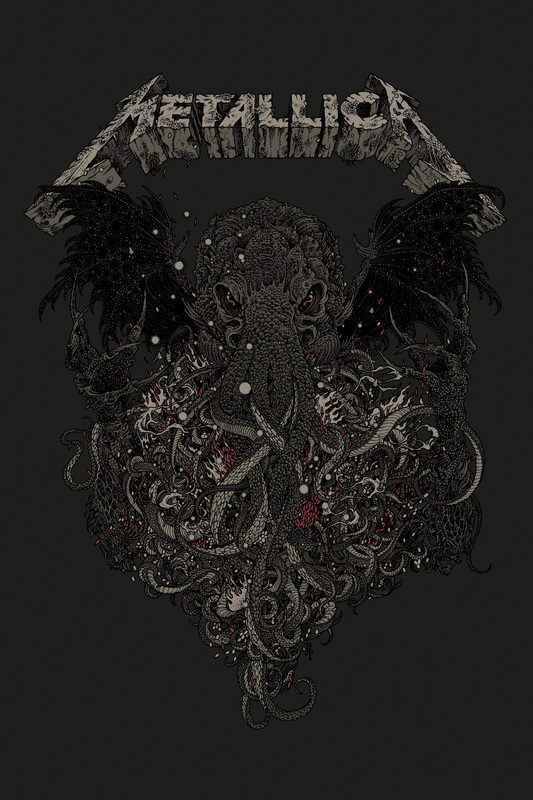 In 2017, Metallica marked a return of their Lovecraftian songs with Dream No More, a song entirely dedicated to Cthulhu and the Apocalypse that its awakening would bring forth. Cthulhu ‘sleeps’ in the sunken city of R’lyeh. Cthulhu haunts the dreams of people worldwide. Interestingly, turning people to stone is an ability that does not belong to Cthulhu — but rather Ghatanothoa from Out of the Aeons; some Lovecraft scholars believe that this story may be a simple reworking of Call. However, this line may simply reference the sailors that froze in or died of fear upon seeing Cthulhu. Posted on 04/03/2013, in Monstrous Songs and tagged Lovecraft, Metallica. Bookmark the permalink. 9 Comments. Didn’t know anything about that last song’s reference, thanks for the info. Comprehensive! We should begin a “Read The Colour out of Space to your kid as a bedtime story” movement! Great job, except the line “drain you with your sanity” should read “drain you of your sanity”. I always thought “Poor Twisted Me” off of Load was a Lovecraft reference too.